This is a continuation of a previous entry. As in real life, the objective is to reach the Saddam Canal and secure it. So, I'm not going to get my Marines too engaged on their way north. I have Charlie Company, which in this scenario has 13 AAVP-7A1s and a single HMMWV for the company commander. According to the book, the amount of AAVP-7A1s was 11 and the command HMMWVs were three. I am expecting Iraqi irregulars armed with automatic weapons, RPGs and mortars along the way. I am going to have my Marines suppress and bypass any resistance until the Sadam Canal Bridge is reached. The Marines tracks have plenty of firepower, yet the game engine mechanics are made in a way that the vehicles can't walk and chew gum at the same time. Every time one of the tracks fire the 40 mm grenade launcher and the .50 cal, 23 action points are depleted from an initial total allowance of 69. This reduces the range of movement of the vehicle. Other thing that is not implemented is the ability of the troops carried in the vehicle to fire from the top of the passenger compartment of the AAVP-7A1s. Shortcomings of the game engine and all, there was plenty of firepower and mobility for the Marine convoy to bypass the enemy resistance. Enemy fire at his point of the game scenario was frequent, but ineffective (as judged by the lack of effect on my vehicles and the visual cues offered by the game [amount of tracers coming out of the firing unit]). I also had the option to call a CAS mission (see screenshot above), but I refrained using it out of fear of getting some friendly fire incident like it happened in the real battle. I don't know if close air support missions can cause blue on blue in the Squad Battles game engine (only thing I've seen is friendly mortar fire falling on my troops). But better safe than sorry. One of the things I noticed in the book was the sheer firepower supremacy that the Marines used against the Iraqi irregulars. In this case I may have gone a bit overboard, twisting the shape of the convoy in a way that my Marines could have many guns on these two targets. In this screenshot, we have taken the first objective (right where the north-most Marine vehicle is located. The tip of the spear is now 2.4 km south of the Saddam Canal crossing. My Marines are enduring intensive enemy fire and are still moving north with no losses in personnel and vehicles. Correction: no catastrophic losses in vehicles, as one track was left immobile by unknown reasons. I could not figure out what caused this mobility loss (no enemy fire seen). Maybe an accumulation of damage? In any case, the guns of this track are still operating, the crew is not injured and the Marine squad that was in it took a defensive position in a nearby building. 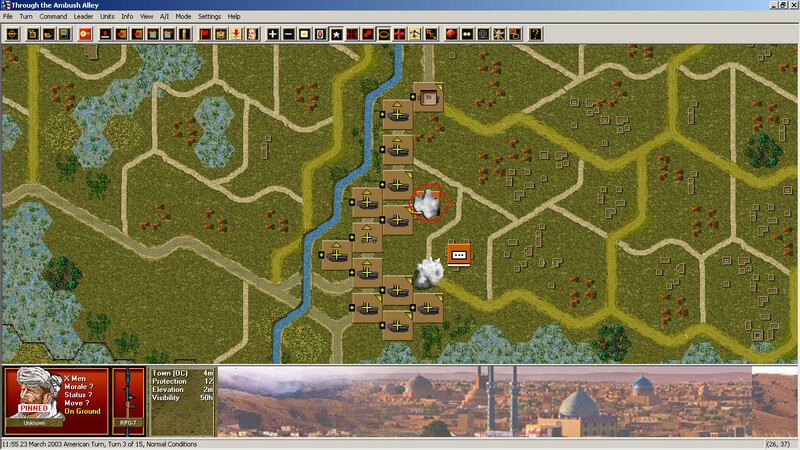 In the screenshot above, note how the convoy has lost cohesion and many gaps are visible. This is the result of having some tracks firing suppressive fire while the rest of the nearby tracks advanced. Ideally, I should have kept the convoy very tightly spaced (so any enemy ambush would face more fire from more than one track). The orderly column I started with, sorted by platoons is a mix-match mess now. I am going to pay for this when I have to deploy the company. Other thing that was featured correctly in the game scenario is the enemy fire coming mostly from the west side of the convoy. The scenario has already deviated from the real life battle because of that mobility kill, which happened some 2.3 km south of the Saddam Canal crossing. The Saddam Canal is a few hundred meters north from the point track. Enemy resistance has intensified at this point. 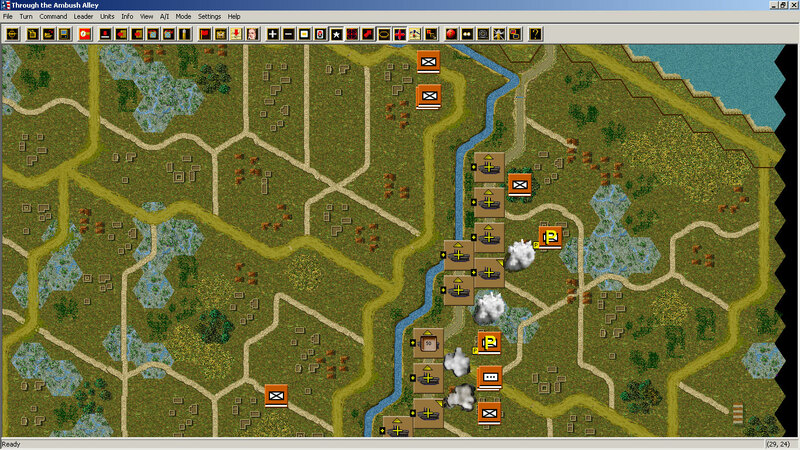 Not that the enemy fire is more effective, but rather the enemy units are less prone to suppression. 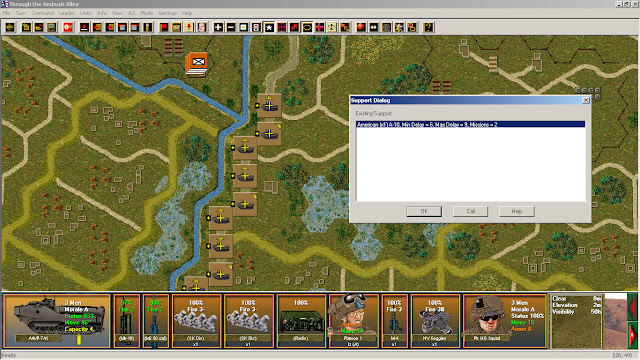 Something is brewing up northwest (note the enemy units just below the game's button menu). This is the so-called "Martyr's District" and was a source of multiple problems for the Marines who fought the real battle. Halfway through the scenario duration, things are going well (two objectives taken, almost reached the Saddam Canal, no casualties but a mobility kill suffered). But the battle is getting more intense. I think I played this before. Nice Scenario. 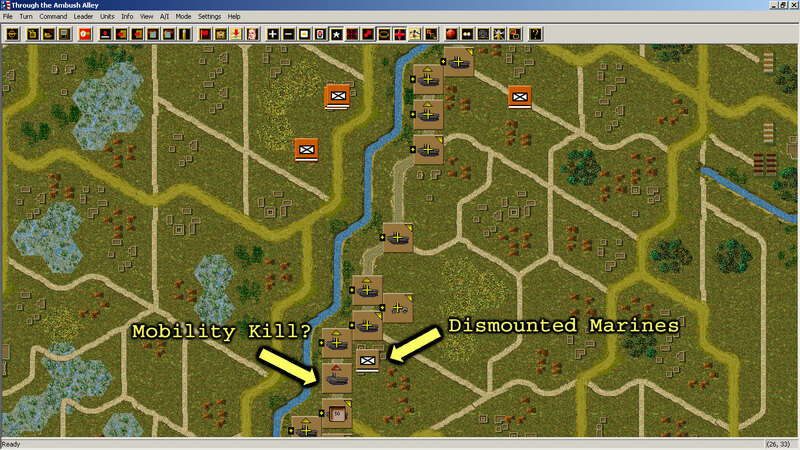 Regarding your immobile vehicle: Aside from enemy fire, there is an immobilization chance when moving from one hex to another. It is a function of movement cost (terrain) and immobilization probability. Stacking also has an effect as it can eliminate road bonus and increase movement cost. Vehicles moving through stacks have more chance of immobilization. Thanks for reading and for the clarification. I will reference to this comment in the blog entry.